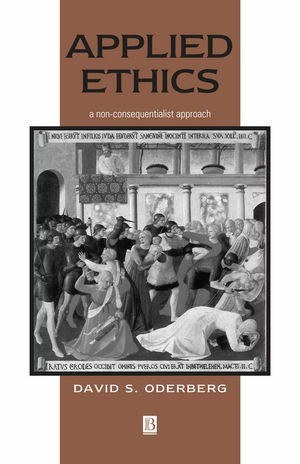 Applied Ethics focuses the central concepts of traditional morality - rights, justice, the good, virtue, and the fundamental value of human life - on a number of pressing contemporary problems, including abortion, euthanasia, animals, capital punishment, and war. David S. Oderberg is Lecturer in Philosophy at the University of Reading. A graduate of the Universities of Melbourne and Oxford, he is author of The Metaphysics of Identity over Time (1993); co-editor, with Jacqueline A. Laing, of Human Lives: Critical Essays on Consequentialist Bioethics (1997), and editor of Form and Matter: Themes in Contemporary Metaphysics (Blackwell, 1999). 1. The Problem of Abortion Today. 2. The Basic Argument and Some Responses. 3. Sentience: A Bad Argument Against Abortion. 4. A Return to the Basic Argument. Objection from Begging the Question. Objection from Sperm and Egg. Objection from Fission and Totipotency. Objection from Cloning and Parthenogenesis. 5. A Feminist Argument for Abortion. 6. The Foetus, the Person and the Person. 7. Abortion, the Law and the Public Good - a Concluding Note. 'I Personally Disapprove of Abortion But Would Not Impose my Opinion on Other People.'. 'It is Not the Business of the Law to Interfere with Such a Difficult Decision.'. 11. Voluntary Euthanasia and Autonomy. 12. Non-Voluntary Euthanasia and 'Quality of Life'. 13. Active and Passive Euthanasia. 14. Ordinary and Extraordinary Means. 15. Euthanasia, Death and 'Brain Death'. 18. The Conditions for Rights - What They Are Not. Action in Pursuit of Desires and Goals. 19. The Conditions for Rights - What They Are. 20. Two Dilemmas for the View that Animals Have Rights. 21. So How Should we Treat Animals?. 23. Punishment - General Principles. 24. Capital Punishment - the Argument. What if an Innocent Person is Executed?. Capital Punishment is not a Deterrent. Capital Punishment is Just State-Sanctioned Murder. Capital Punishment is Cruel and Inhuman. What about Mercy and Compassion?. Capital Punishment Fails to Respect Persons. 26. Concluding Remarks on Hypocrisy. 28. War, Pacifism and Self-Defence. Basic Principles of the Just War. Questions about the Justice of the Cause. * integrates traditional morality as discussed in Moral Theory and applies it to contemporary controversies such as abortion, euthanasia, animal rights, capital punishment and war.